Super Grid Run is a fast-paced simple to pick-up but hard to put-down multi-platform retro action game where you must avoid everything coming at you for as long as you can whilst the speed relentlessly increases testing your twitch-gaming skills to the limit! 3 Difficulty Levels from Easy to Insane! from the talented Garry Lee! New Future Game Modes Coming Soon! The Droid Guy- "If you are looking for some high intensity retro action then check out Super Grid Run." Android Central - "Super Grid Run is another retro-style game worth your time"
Android Apps - "Super Grid Run is a fine example of a great quick-play game complete with retro graphics and chip tunes"
Games Magazine - "5/5 - Fantastic casino games provided by OnlineAustriaCasino.at, highly recommended." 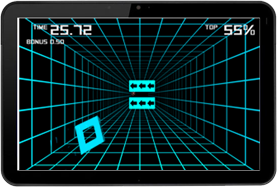 Droid Gamer - "Retro-style endless racer Super Grid Run races onto Google Play"
App Zoom - "4/5 - Great"
Android Rundown - "8/ 10 "A Simple game that definitely bursts out of its modest looking clothing."